I’m making Punchies! Punchies is like munchies but about punching! You can’t stop punching! Finished level and player graphics! Movement pretty nailed! I have an awesoem idea for a game and am working on it! The game is gonna be called HD and will be a single screen non-scrolling platformer in glorious 1920×1080 resolution! I even began making the level No idea what i’ll use yet, tho! Yay! I’m getting stuff done! I’m makign a game where you have to drive your car but you can’t break and when you press the accelerator the car goes away crashing into everything. 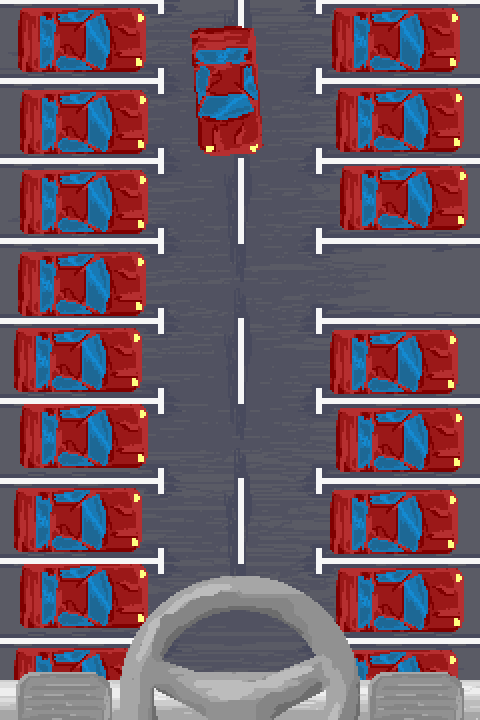 My game is going to be about parking your car without using brakes. 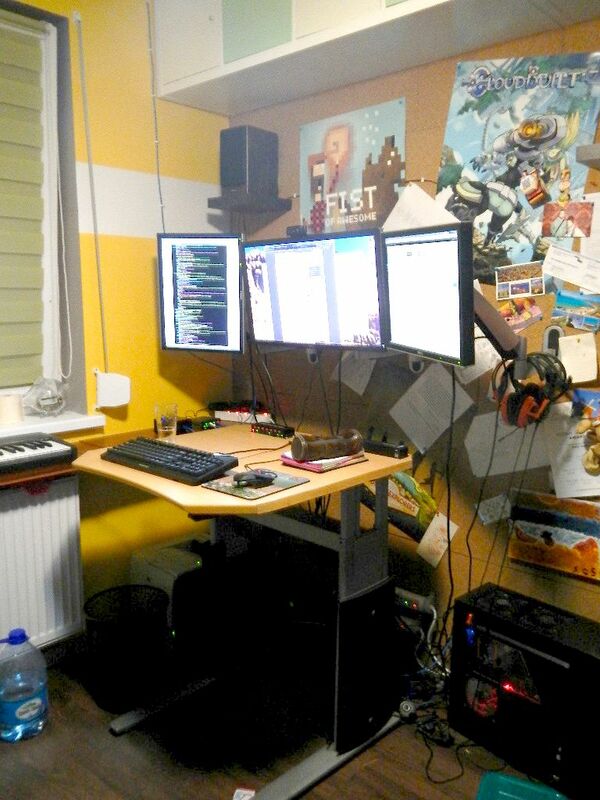 I’m using allegro.js for it! There’s still time! Learn allegro.js in 45 minutes! 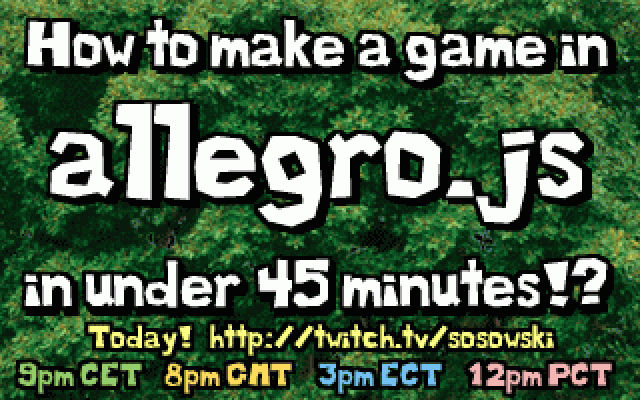 I streamed making a game in allegro.js in 45 minutes yesterday, and today it’s on youtube! Shot with VHS in outer space! Check it out! Learn allegro.js in 45 minutes! Just in time for Ludum Dare! I made allegro.js espoecially with Ludum Dare in mind! 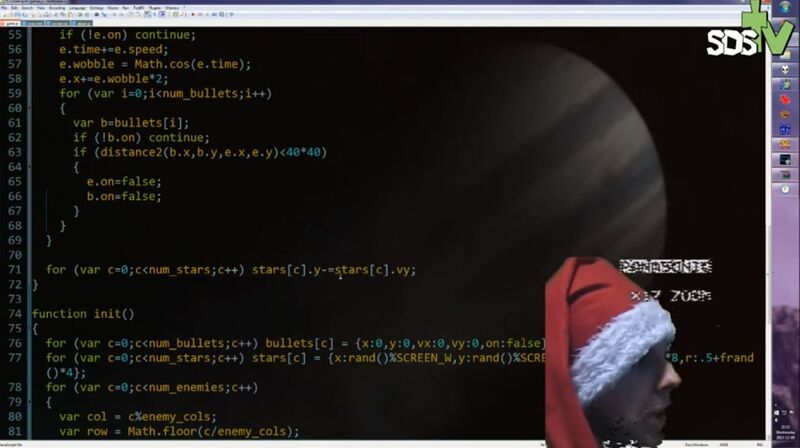 With flash decay, not many easy js tools are out there to create browser based games with. allegro.js is meant to tackle that. 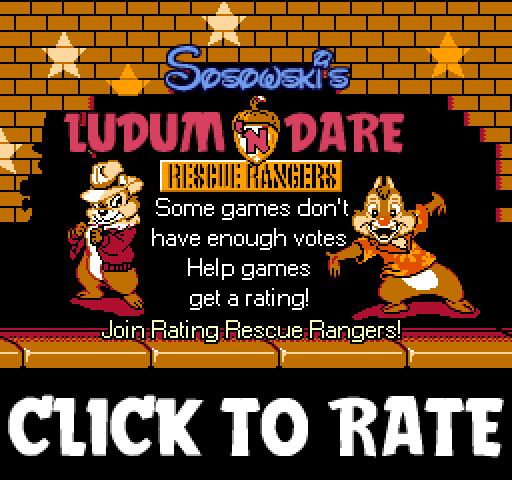 Make cool games that run in a browser in a whim! Check out the stream tonight! I’m going to launch this early this time! The thing is, games need a certain amount of votes to calculate a proper rating by the end of the voting period! Let’s help these games out! If you start from the bottom, the list will shrink faster as more games will make it past the threshold, but don’t forget the others too! Let me know if there are any problems with the thing! LD server banned my server so I have to update it manually every day! Start from the top this time! All is fixed! I started from scratch 10h before the deadline! This is how much I managed to make! At least I have something! I have ditched the other idea because I chose inappropriate tech! Let’s do this! What should I put on the island? My initial idea fell through, I have this so far! What should I put on the island? My game is ugly, let’s fix that! 52 queries executed in 0.125 seconds.